I wonder if you have noticed? Making crispy and fluffy waffles has become one of my latest obsessions lately... Opsie! Fat makes real crispy waffles! Without fat, the waffles are like hmmm... At here, I have tried using no fat yogurt with no additional fat to make very fat reduced waffles. They are good enough to eat BUT ONLY when they are consumed immediately. Cooling the waffles and even slightly will shrink them dramatically and even keeping them in a warm oven won't save them! As mentioned at here, I would say that sour cream is my best discovery to make the most fabulicious waffles! At here, the pandan waffles that I have made with coconut milk are like the waffles made with sour cream. Both are structurally stable and can stay crispy for up to an hour at room temperature! I wonder if you can notice the subtle difference but I do. 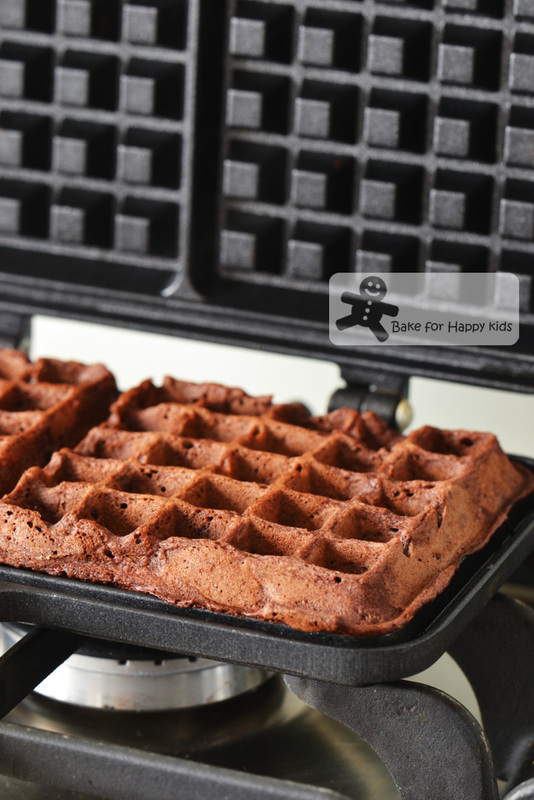 As mentioned at here, I can taste that the use of cake flour can make the waffles lighter and softer. It is essential to use baking soda if the waffle recipes contain sour cream or buttermilk or any acidic fermentation byproducts like this yeast-raised waffle recipe as this alkaline chemical compound will react with the acidic batter to yield fluffier and even crisper waffles. Based on here, here, here, here, here and also my here, many of waffles lovers including me agree that the stiff-whipped egg whites makes good fluffy waffles but depending on the recipes, some good waffles like here, here and here that I have tried and tested don't require this troublesome step at all! As seen at here, I can't deny that the addition of a tiny amount of shortening (like one tablespoon in 5 waffles) can make a lot of difference in the crispness of the waffles! Having said that, this addition is entirely up to you! Just in case if you have under-cooked your waffles, this is the best way to save your waffles!!! ... and doing this can help the waffles to maintain their crispness if they are not going to be consumed immediately! Would you believe? ... without the use of sour cream, coconut milk, cake flour, shortening, a lot of butter or oil and stiff-whipped egg whites, I have managed to make another batch of good crispy waffles! And this might be due to the addition of cocoa powder, chocolate or buttermilk? Do you think that cocoa, chocolate or buttermilk will be my ninth, tenth or eleventh key waffles ingredients??? This is how I cook these easy chocolate waffles. First, I gathered the wet ingredients. 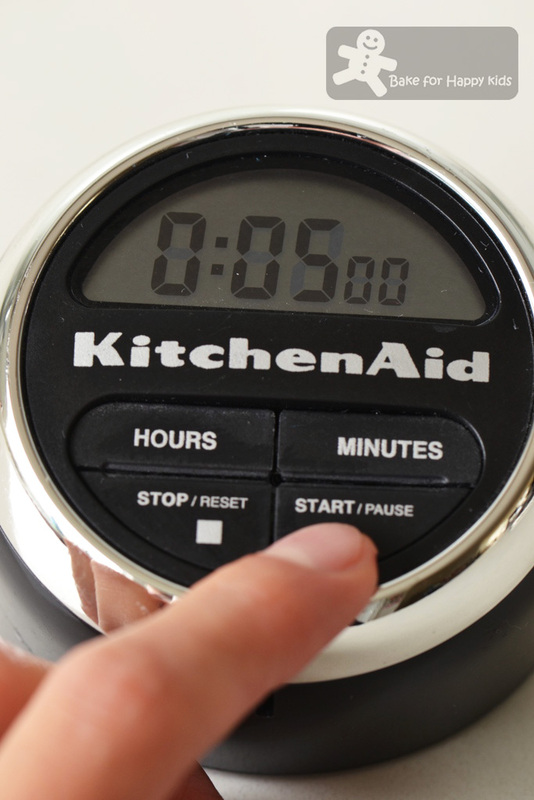 It's quick and easy as no beating of egg whites is required. Last, whisk in chocolate chips or callets. Allow batter to rest for 5 minutes. Make sure the waffles are thoroughly cooked! The partially cooked waffles won't be as crispy as the thoroughly cooked ones. 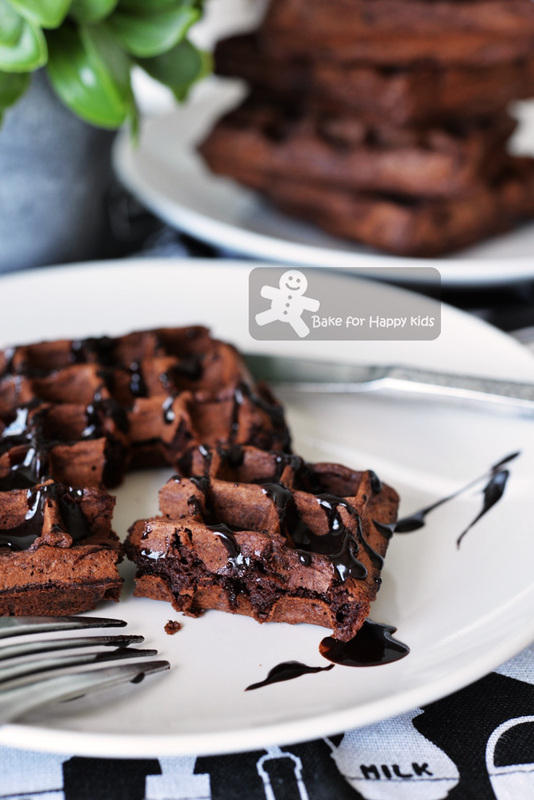 I always thought that I would need at least 10g of added oil or butter to make each decently crispy waffle and wasn't expecting these not-so-fatty chocolate waffles tastes so wickedly delicious! Not-so-fatty? Each of these waffles is made with about 5g of added butter, 3g of sugar (which is quite minimal), 2% fat buttermilk and 8g of chocolate with 70% cocoa (with about 40% fat). 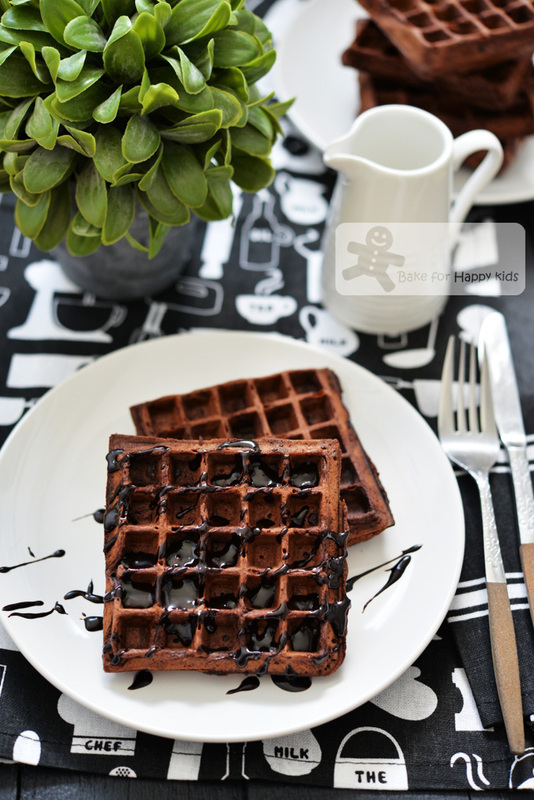 Comparing to some other chocolate waffles recipes (especially this highly reviewed one that I have seen at Food.com), you have to agree that this is definitely the skinnier chocolate waffles! Are cocoa powder, chocolate and buttermilk my ninth, tenth or eleventh key waffles ingredients? I would say yes at this moment! Now I shall stop my blah blah blah and enjoy these lovely waffles. Combine all dry ingredient A in a bowl. 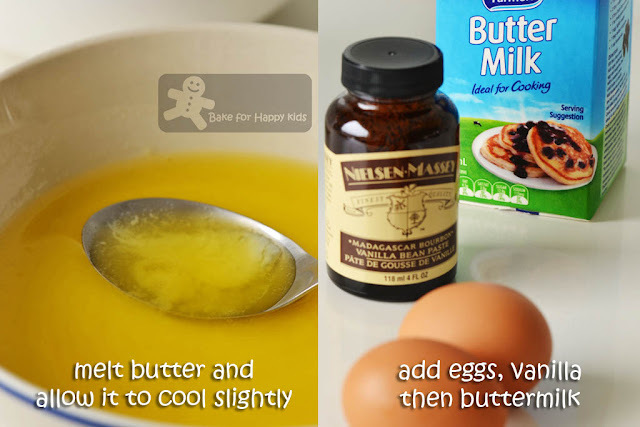 Using a whisk, combine eggs, melted butter and vanilla from wet ingredients B in another large mixing bowl and then add the buttermilk. 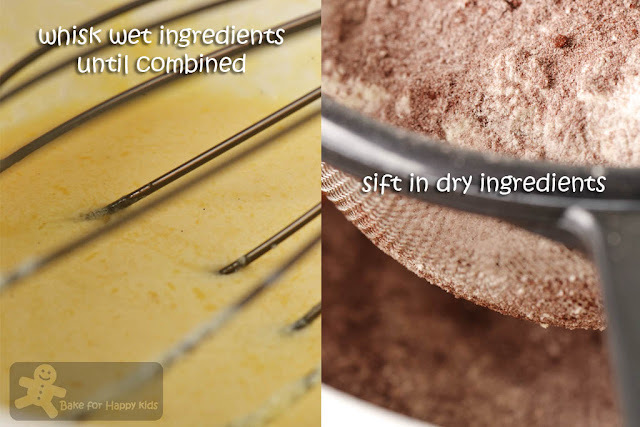 Sift the dry ingredients A into mixture B and whisk until the batter is just smooth. Do not over mix. 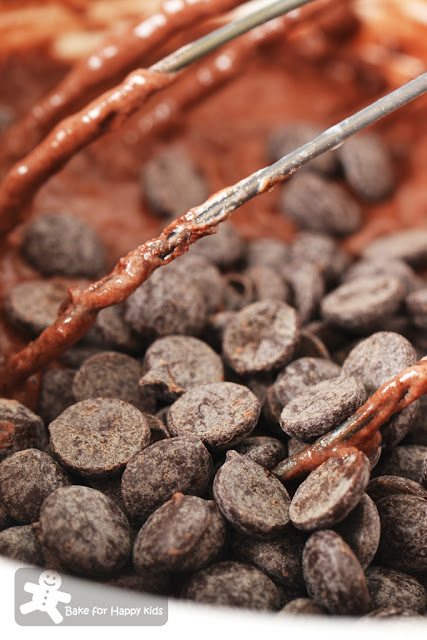 Stir in the chocolate chips or callets until just combined. Allow to rest for 5 mins. Preheat waffle iron to its medium low heat setting - not the lowest! Spray preheated waffle iron with non-stick oil spray. Caution: If you are cooking waffles on the your stove, please do not spray cooking oil into direct fire! Pour adequate waffle batter (about 1/3 cup to 1/2 cup) onto hot waffle iron. As this mostly buttermilk watery batter does not expand a lot during cooking, please make sure the waffle iron is fully covered with the batter. Cook until both sides are crispy and is easily removed from iron. If the waffles are not easily removed from the iron, this means that they have not been thoroughly cooked and won't be crispy! Repeat this step until all the batter has been used. Serve immediately most ideally with Ben and Jerry's hot fudge sauce (recipe at here) or keep warm in a 100°C or 200°F oven until ready to serve. Your waffles are so perfect and delicious too. These waffles look amazing!!! I seriously need to buy a waffle iron! I am more of a pancake person than waffles. This just might get me to try making some . This is totally wow! Can't wait to try these... delicious!